The diameter of a tree provides a measure of tree performance and is a useful starting point for estimating tree volume. By convention, the diameter of forest trees is measured in centimetres at 1.3 metres above the ground, and is termed the Diameter at Breast Height or DBH. Because trees are measured with the bark on, this may also be called the Diameter at Breast Height Over Bark (DBHOB). 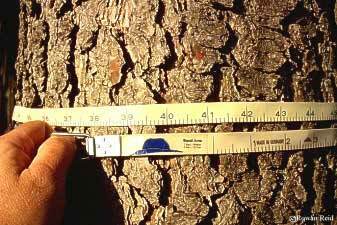 When measuring live trees most information is presented as over bark dimensions. It is possible to estimate the depth of the bark by cutting through the bark to the wood and measuring bark depth or by observing the bark of recently felled trees and then converting DBHOB to the Diameter at Breast Height Under Bark (DBHUB). Tree diameter is measured at 1.3 m above the ground. The tape simply shows the diameter that corresponds with the circumference. The circumference of a circle is equal to p x d where p (or Pi)Ý = 3.142 and d is the diameter. If the diameter of a tree is 30cm the circumference will be 30 x 3.142 = 94.3cm. The 30 mark on the diameter tape matches 94.3cm on the conventional metric measure. The markings on the diameter tape side are simply 3.142 centimetres apart so that diameter doesnt need to be calculated. It is simply read off the tape. Be sure to read the scale on the correct side of the tape. 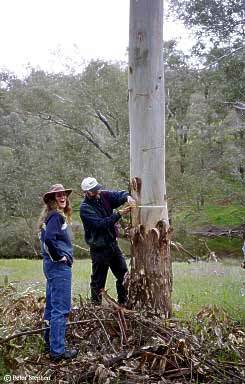 The tape must be held tightly around the tree at right angles to the main stem, and any loose, peeling bark should be removed. On sloping ground, breast height should be measured from the uphill side. This is because the slope will determine the ultimate height of the stump. Obvious swellings, distortions or branches at 1.3 metres need to be avoided. If there is a distortion at 1.3 metres, measure the diameter 10 cm up (at 1.4m) and again at 10 cm down (at 1.2m) and take the average of the two measurements. Measure diameter to the closest 10th of a centimetre as shown by the graduations on the tape (eg the diameter in the above photo is 41.1cm). Sometimes calipers are used to measure diameter because they are quicker, especially with small trees. For larger trees however, if callipers are used it is important to measure both the largest and smallest diameter and calculate the average diameter from these two measurements. Many American farm foresters use a "Biltmore stick" to measure diameter. The straight wooden stick is graduated for direct readings of tree diameters by an operator looking from a set distance, say 75 cm.Ý Although the user cannot set the full diameter of the tree, the stick is carefully calibrated (the marks get closer together as tree diameter increases) making it possible to measure a tree larger than the length of the stick. It is understood that no metric version of the Biltmore stick is currently available. Measuring diameter with a carefully calibrated Biltmore stick.